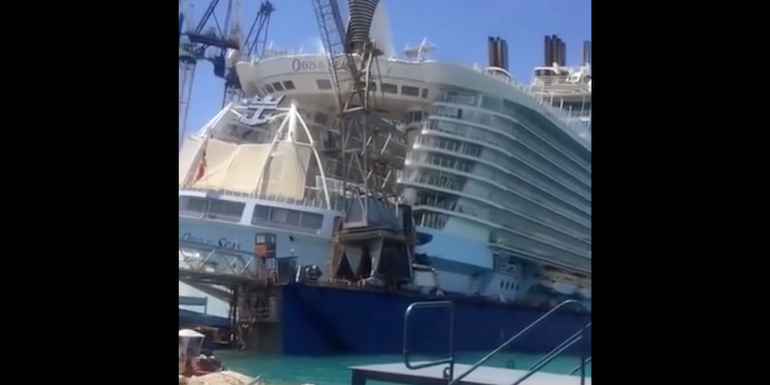 Royal Caribbean’s mega-ship Oasis of the Seas was involved in an apparent dry dock failure and a crane accident in the port of Freeport, Bahamas on Monday. Oasis of the Seas was in the Grand Bahamas shipyard for one week for scheduled repairs to her azipod propellers ahead of her transatlantic crossing for a dry dock in Europe this summer. 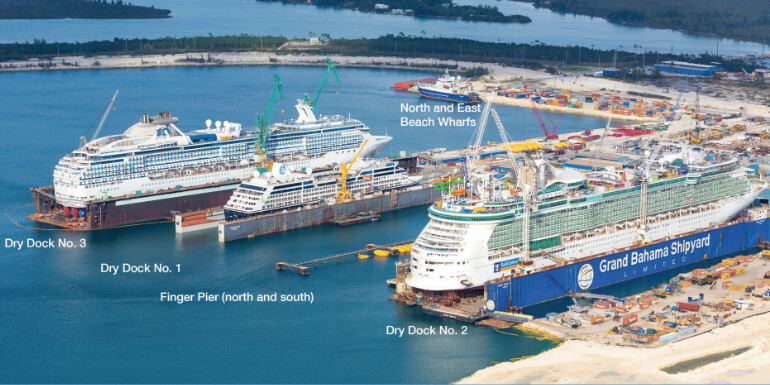 Floating dry dock #2 at the Grand Bahama Shipyard is the largest dry dock near the United States and can handle most cruise ships. But Oasis-class ships are too large (According to the Grand Bahamas Shipyard website, floating Dry Dock #2 can accommodate ships up to 985 feet, with a maximum beam of 154 feet and a draught of up to 27 feet. Oasis of the Seas has a length of 1,186 feet, 198 ft. maximum beam and a draught of 30.6 feet.). To be able to repair azipods on Oasis-class ships on this side of the world, the Grand Bahama Shipyard utilizes a system of cofferdams - or watertight enclosures below the water line - that surround the azipods while the rest of the ship is still floating. This procedure was first conducted in 2014 on Allure of the Seas, the subject of this documentary on YouTube. The cofferdam procedure had started Sunday, March 31 and was well underway on Monday morning, April 1 as shared on Facebook by Royal Caribbean chief meteorologist James Van Fleet. 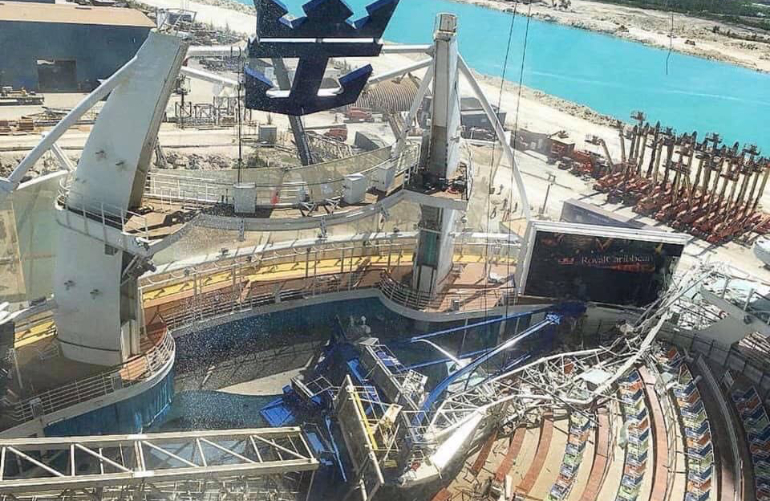 From videos of the incident shared on social media, it appears either the cofferdam on the starboard side of the ship failed or the floating dry dock structure itself failed or collapsed, causing the Oasis of the Seas to list to starboard, likely resulting in an impact to the crane on the floating drydock, causing it to topple and fall into the Aqua Theatre on the aft of the ship. No guests were onboard or involved in the incident. However, there were crew and construction workers onboard. In a later statement to News 6 in Orlando, Royal Caribbean officials said Shipyard management notified them that eight people were injured in the incident, and none of their injuries were considered to be life-threatening. Oasis of the Seas was the world’s largest cruise ship when she debuted in 2009. Her most recent dry dock was in 2014 in Rotterdam, Netherlands. There's no word yet on whether there will be a delay in the ship returning to service because of the accident. Updated at 10:45 am on April 2, 2019. Originally Published on April 1, 2019. Have you ever sailed Oasis of the Seas?